The award-winning author of Hank & Chloe presents her new literary novel about two women — one a young mother newly out of rehab, the other a painter just diagnosed with a progressive disease — who are both connected to the same troubled man and his wayward daughter. Skye Elliot is given a choice after her car accident — jail or rehab — and her ex-husband, a bull rider who introduced her to the party scene, gets custody of their four-year-old daughter Gracie. It takes Skye eight months to get clean, but the day she is released, she has one plan: to be a good mother — better, at least, than Skye's own selfish mother and absent dad. Owen Garret hasn't seen his daughter in ten years. He, too, needs to make amends. Newly out of prison, he picks her up from rehab and together they set off to find Gracie, and to forge a relationship that transcends the hurt and anger that have brewed between them for almost a decade. In the meantime, they find Margaret Yearwood, too — Owen's lost love whom he left when he turned himself in for a long-ago crime. Owen's Daughter is a stand-alone novel that brings back characters from Mapson's treasured novel Blue rodeo, and introduces them to the beloved cast of Solomon's Oak and Finding Casey. With its father-daughter story and characters who overcome personal failings against great odds, Owen's Daughter is a story of love and family that will enchant Mapson fans both old and new. ABOUT THE AUTHOR Jo-Ann Mapson, a third generation Californian, dropped out of college to marry, but later finished a creative writing degree at California State University, Long Beach. Mapson is the author of the acclaimed novels Shadow Ranch, Blue rodeo, Hank & Chloe, and Loving Chloe. Setting her fiction in the Southwest, Mapson writes about a region that she knows well; after growing up in California and living for a time in Arizona and New Mexico, Mapson lives today in Costa Mesa, California. She attributes her focus on setting to the influence of Wallace Stegner. The award-winning author of Hank & Chloe hosts a writing workshop that asks participants to draw from their own lives to put together a plot, story, and narrator. Inspired by bestselling literary author Mary Pipher's Writing to Change the World, Mapson guides participants through writing exercises that use their own experiences to create material. She asks aspiring authors to write out their own ancestry and pair it with concrete images in order to construct the structure of a story. WORKSHOP DETAILS Cost: One (1) copy of Owen's Daughter. Registration and pre-payment at 480.730.0205. Skye Elliot is given a choice after her car accident--jail or rehab--and her ex-husband, a bull rider who introduced her to the party scene, gets custody of their four-year-old daughter Gracie. It takes Skye eight months to get clean, but the day she is released, she has one plan: to be a good mother--better, at least, than Skye's own selfish mother and absent dad. Owen Garret hasn't seen his daughter in ten years. He, too, needs to make amends. Newly out of prison, he picks her up from rehab and together they set off to find Gracie, and to forge a relationship that transcends the hurt and anger that have brewed between them for almost a decade. In the meantime, they find Margaret Yearwood, too--Owen's lost love whom he left when he turned himself in for a long-ago crime. Owen's Daughter is a stand-alone novel that brings back characters from Mapson's treasured novel Blue Rodeo, and introduces them to the beloved cast of Solomon's Oak and Finding Casey. With its father-daughter story and characters who overcome personal failings against great odds, Owen's Daughter is a story of love and family that will enchant Mapson fans both old and new. 7PM WEDNESDAY, OCTOBER 17 Jo-Ann Mapson: Finding Casey ﻿ ﻿Award-winning novelist Jo-Ann Mapson presents Finding Casey. ﻿Glory Vigil, newly married, unexpectedly pregnant at forty-one, is nesting in the home she and her husband ﻿have just moved to in Santa Fe. Their adopted daughter, Juniper, is home from college for Thanksgiving and in love for the first time, quickly learning how a relationship changes everything. But Juniper has a tiny arrow lodged in her heart, a leftover shard from the day eight years earlier when her sister, Casey, disappeared—in a time before she'd ever met Glory and her husband. When a fieldwork course takes Juniper to a pueblo only a few hours away, she finds herself right back in the past she thought she'd finally buried. ABOUT THE AUTHOR Jo-Ann Mapson is the author of Hank & Chloe, Blue rodeo (now a CBS TV movie starring Kris Kristofferson), Shadow Ranch, Loving Chloe, The Wilder Sisters, the Bad Girl Creek trilogy, The Owl & Moon Cafe, and Solomon's Oak. Finding Casey is her eleventh novel. Glory Vigil, newly married, unexpectedly pregnant at forty-one, is nesting in the home she and her husband, Joseph, have just moved to in Santa Fe, a house that unbeknownst to them is rumored to have a resident ghost. Their adopted daughter, Juniper, is home from college for Thanksgiving and in love for the very first time, quickly learning how a relationship changes everything. But Juniper has a tiny arrow lodged in her heart, a leftover shard from the day eight years earlier when her sister, Casey, disappeared-in a time before she'd ever met Glory and Joseph. When a fieldwork course takes Juniper to a pueblo only a few hours away, she finds herself right back in the past she thought she'd finally buried. A love story, a family story, a story of searching and the bond between sisters, Finding Casey is a testament to human resilience. This completely stand-alone novel, featuring beloved characters from Solomon's Oak, will charm Mapson's readers and move her into a larger sphere. Jo-Ann Mapson's book Solomon's Oak was available from LibraryThing Early Reviewers. 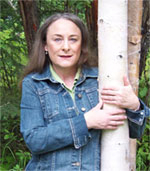 Jo-Ann Mapson is currently considered a "single author." If one or more works are by a distinct, homonymous authors, go ahead and split the author. Jo-Ann Mapson is composed of 3 names. You can examine and separate out names.